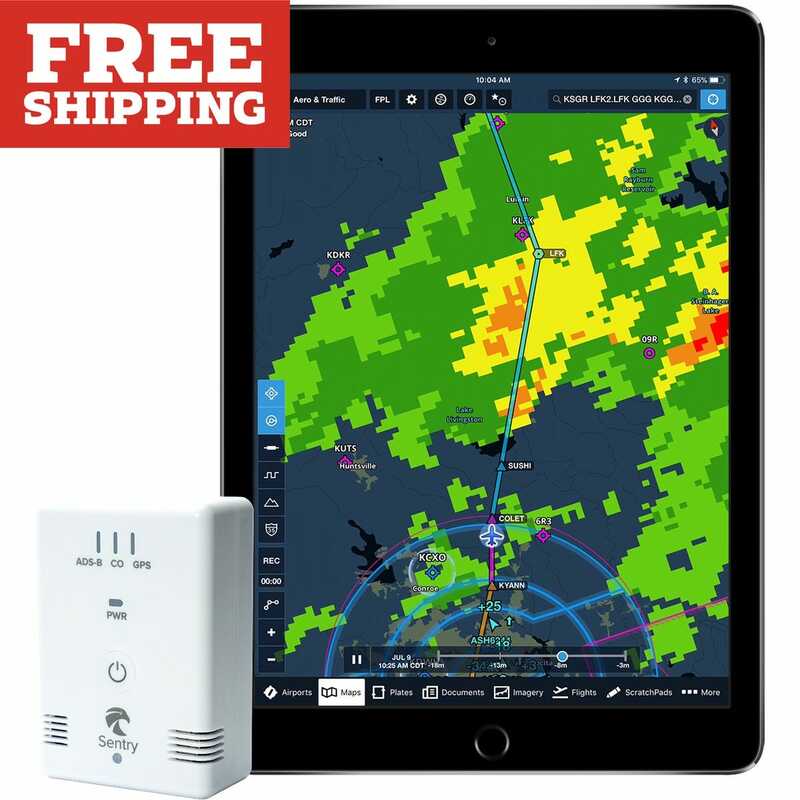 Sentry is a compact, affordable ADS-B receiver specifically made for ForeFlight. 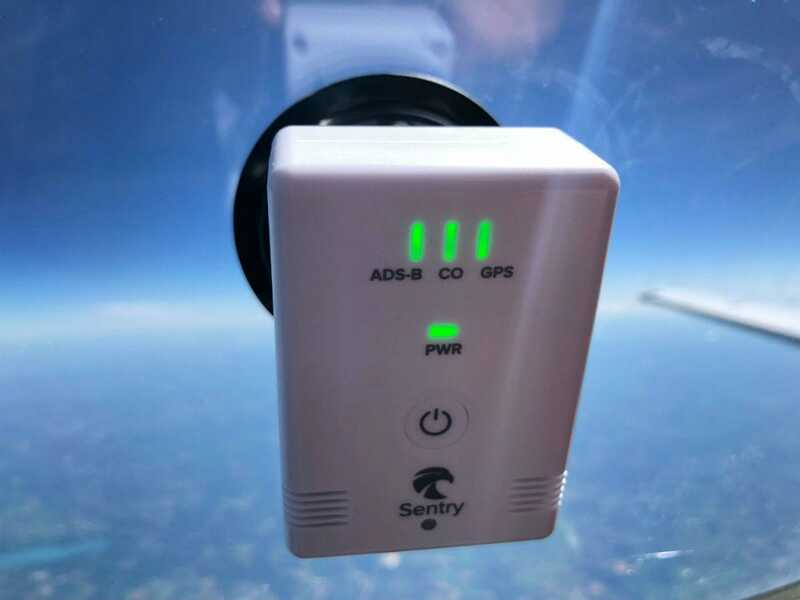 In addition to popular features like ADS-B weather and traffic, Sentry also includes a carbon monoxide detector to warn of dangerous conditions in the cockpit. No larger than a deck of cards, Sentry packs long list of features into a small size, but still offers 12 hours of battery life. With onboard memory supporting up to 30 minutes of FIS-B data, Sentry saves animated radar and other weather so data is available as soon as you connect. Turn off your iPad screen and save battery when not in use. 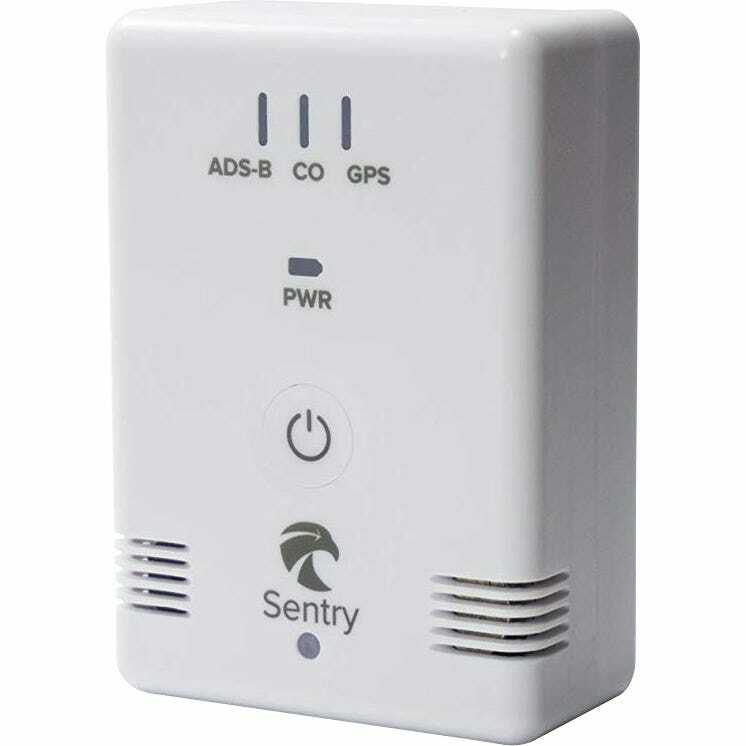 A first for portable ADS-B receivers, Sentry provides a built-in carbon monoxide sensor and alerting system, with an audio and in-app alert when CO concentration reaches hazardous levels. The LED indicator also provides a visual indication of CO levels. ForeFlight Synthetic Vision provides a backup glass cockpit on your iPad that can help you stay aware of your position and surroundings in normal and emergency operations. Combined with Sentry, Synthetic Vision provides super responsive pitch and bank in addition to terrain and obstacle depictions. Simple calibration supports mounting Sentry on the left window, dash, or right window. Sentry’s efficient power usage allows 12 hours of continuous operation on a single charge, providing non-stop situational awareness for the long haul. Recharges using included USB-C cable. Sentry’s quick release mechanism means you can attach and remove it in under a second. The popular RAM® suction cup mount ensures a long-lasting seal and high heat tolerance so you can leave it in the plane between flights. If you’ve got room for a deck of cards in your aircraft, you’ve got room for Sentry. Large enough to not get lost under the seat, yet small enough that it doesn’t block your view, and the internal battery makes charging simple and straightforward. Measures 2.25”w x 3.25”l x 1.25”d. Updating Sentry’s firmware is a non-issue thanks to fast over-the-air updates through ForeFlight. When an update is available, ForeFlight provides one-tap installation that finishes in seconds. 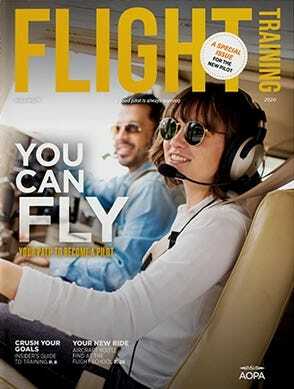 Note: Requires ForeFlight version 10.2 or higher. Works better than I expected. A friend has one of the other ADV-Bs that cost a lot more, but does not perform as well. Battery appears to last 12 hrs as advertised. Charged once when I got it and have not touched it since. I have had the Sentry for over 6 months now. Although its firmware is updated, it consistently disconnects from the iPad, iPhone, etc. As an instrument student, this becomes annoying when utilizing approach charts and such with gps overlay. I'm there one moment, gone the next. Another CFII that works where I am taking my training is having the same issues as I am and he is on his second Sentry. I would pay a few extra for the Stratus if I could do it all over again. Now, just trying to get someone to get it fixed or send me a fixed one. I do not recommend this, it is too expensive to be the unreliable. I have had this for two months, and flown IFR in the Houston Class B, DFW Class B, Tulsa and some remote areas in Texas, Louisiana and Arkansas. It has performed well and accurately paired with my IPAD Mini in my Bonanza. I actually saw potential traffic alerts including military before ATC notified me. I do have ADS-B out installed on the Bonanza. Does everything as advertised. Works great with my iPad mini 4. Just got it and only an hour and a half of actual use. Therefore, I can't give a value for durability or reliability. Give me a year. The unit is dead simple to turn on and use with my iPad Mini 4. The motion sensors it uses for a reference platform work so well, they don't seem to drift at all. Works like a champ. Love the weather, the traffic and the backup AHRS. The CO2 monitor is a great bonus and nice piece of mind. Have used it pilot-side window and on top of the glare screen. Convenience and reliable. Nice to have a backup AHRS with GPS makes flying even safer! I have a few friends who recommended the Sentry over the Stratus as a Flight Instructor, and they were right! It's been absolutely worth the reliability and the comfort of knowing what's around you. Everyone, from a Private Pilot up to the Pro's, will appreciate the increase in situation awareness the Sentry brings. I'd absolutely buy it again. What’s the difference between this device and stratus 3? 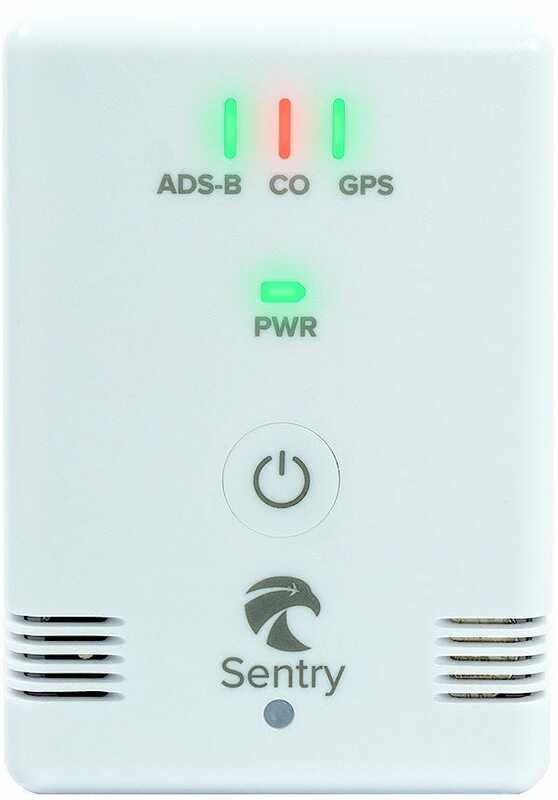 BEST ANSWER: The Sentry has no external antenna connections, a longer battery life of 12 hours and a CO detector. The Stratus 3 has flight data recording, external antenna connections, and is capable of working with apps other than ForeFlight. Does this support GLONASS or only GPS? Also what about the new GPS frequencies that are coming online L2 and L5? BEST ANSWER: Yes it does both GPS (WAAS) and GLONASS. Other than the CO2 monitor, what is the primary difference between this and the scout which costs less than half of what this unit retails for? BEST ANSWER: Scout does not have a built in GPS, battery, or AHRS for backup attitude. It only does ADS-B. After 5 hours charging the pwr light is blue not green. This normal? BEST ANSWER: My initial charge took longer than 10-15 minutes. But honestly I don't recall the total time. If you leave it on the charger the unit will shut the lights down when fully charged. Blue light while charging. Disconnect the power and turn the unit on it will display level of charge via light colors. Did you mean to say it took more than 10-15 HOURS? 15 minutes wouldn’t be long enough to charge anything this demanding. When I charge mine, the blue light means it's charging and when its done charging the blue charging light goes off. There is no green light when charging..at least for mine. Blue light indacates charging. Blue light goes out when fully charged. Length of charge time depends on level of residual charge remaining. what is the benefit of the stratus 3 having an external antenna port and the Sentry not having one? What exactly does the external antenna do? BEST ANSWER: It just offers more options for mounting - you could mount the Stratus semi-permanently under the panel or in the back of the airplane, and use an external antenna to maintain good reception. The other benefit would be in areas of marginal ADS-B coverage, where that antenna improves reception. However, most of the time it's not a big issue. Is the weather resolution the same as an XM weather unit? BEST ANSWER: For the most part it's the same, except that ADS-B radar only shows good resolution within about 150-250 miles of your airplane. 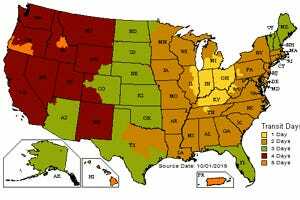 SiriusXM weather is full resolution nationwide. So if you're comparing radar at long distance, the ADS-B will be noticeably blockier. Does this only work with fore flight? BEST ANSWER: Yes, it only works with ForeFlight. BEST ANSWER: Yes, the Sentry can be used world wide. The FIS-B functionality will only work in the US and UK but all other functionality will be supported world wide. 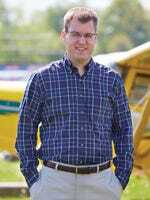 You'll still have GPS, CO monitor, ADS-B Traffic reception, and AHRS regardless of location. The unit will function only as a GPS and CO2 detector in Japan. Why not AHRS? Pressure altitude? Does it have flight recording capability as with the Stratus? BEST ANSWER: It is possible but I have not heard of any mention of that either. Please watch our website. I remember when the sentry was first released that there was a mention of flight recording coming in a future release. Now, I don't see any mention of that. Has that changed? Can i see traffic’s detail such as, groundspeed, callsign or another with sentry? BEST ANSWER: Yes, you will see track, altitude and N number if the traffic is ADS-B Out equipped. Are there any altitude or line of sight limitations for using Sentry? BEST ANSWER: Like all ADS-B receivers, you'll need to be in flight to get reception most of the time. Coverage is quite good above about 1500 ft. AGL, but like VOR the reception does depend on line of sight. Does Sentry require WiFi to operate.? BEST ANSWER: Sentry will create a WiFi signal to the iPad/iPhone. It does not provide internet access. I use foreflight on my IPad Pro. What will my screen look like when I am receiving surrounding traffic ? BEST ANSWER: It will have a blue triangle that represents an aircraft. What Bluetooth code should be used to pair with ipad? Is the GPS WAAS or GLONASS? BEST ANSWER: It is a WAAS GPS and also GLONASS. Is it overkill having this if you fly a G1000 equipped aircraft? BEST ANSWER: Not at all, it will provide you with a backup. Does it come with a mounting device like a suction cup? BEST ANSWER: Yes, this included the suction cup. Can the unit be mounted upside down? Foreflight appears to have three mounting settings for it, and the one that's not on a side window appears to be right-side-up on the glare shield. Suction cup upside down from the center of the windshield between the sun shades would be an ideal, out of the way location in my plane. But curious if Foreflight will accommodate this orientation. BEST ANSWER: Yes, I connected my iPad to the sentry with the unit upside down. Make sure to mount the unit then turn it on so that the Sentry can calibrate. I love the integrated CO monitor, but electronic CO monitors usually have a life of 5-7 years. Does this have an EOF for the CO monitor? BEST ANSWER: The manufacturer does not list an end of life for this unit. Will it work on an Iphone instead of an iPad? BEST ANSWER: Yes, Foreflight will work on an iPhone and the Sentry will provide data. Can I use this item in Slovenia ( Europa )? Will the sentry pick up lightning and echo tops? BEST ANSWER: It will when products are broadcast over the ads-b system. Do I need the foreflight synthetic vision for backup-attitude, or is (pure) attitude provided in the basic foreflight package? BEST ANSWER: Yes, you should be able to use the AHRS without the Synthetic vision. Do I need wifi plus cellular on my iPad for full functionality? BEST ANSWER: No, just the WiFi is required. Can it be connected to Android devices? BEST ANSWER: No, the Sentry is an IOS exclusive product. Does it work with other EFB's besides Foreflight? Will this unit function normally in flight while charging? Such as forgetting to charge before a flight and don’t have time to charge prior to departure. BEST ANSWER: It will fully function and operate while being charged, just tested this out in flight recently. Can I used with my iPad? BEST ANSWER: Yes, it works with the iPad and ForeFlight. Will the Stratus 3 or Sentry work with heated windows on corporate aircraft? BEST ANSWER: The heated windows present a problem for the reception with both units, although in most cases they will work. For particularly thick windsheilds (Learjets, for example) an external antenna may be required. The Stratus includes ports for an external GPS and ADS-B antenna, while Sentry does not. I would recommend the Stratus if you're concerned about it. Does anyone know if this unit also receives and shows air traffic as part of its presentation?